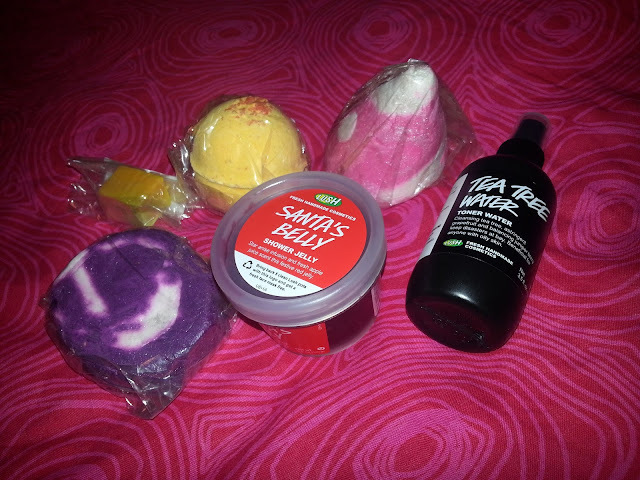 Deidre's Discoveries: Birthday Lush Haul! It was my birthday a few days ago, and I decided I would make a small Lush purchase. I really wanted to try the Cranberry mask but when I finally got the chance to visit a phyiscal store, they were sold out. Unfortunately I won't be going back any time soon. I ended up placing an order a few days later for some other products I wanted to try. I really wish they did send out some of the masks through the mail. When I get packages from them, it says it comes from the East Mall, which is probably like an hour to an hour and a half away from me. I get their packages really quick. I wish that if you lived within a certain radius of their shipping facility or store, then they would send the masks. If Scentsy can mail wax bars in the middle of the summer without melting, from the US to Canada, I think Lush can send out some fresh masks in the middle of the winter. So, that's my rant for the day lol. "Can't handle the merriment? It’s all humbug, I tell you. Humbug! If the Christmasy sights seem horrible as can be, cleansing tarragon mixed with relaxing fennel provide a welcome antidote. 'Tis the season of avoidable merriment, so pop on a frown and crumble this moody, deep purple bar under running water. Its enticing licorice scent with softening organic illipe butter provide safe haven for Scrooges." Personally, I didn't find the licorice/fennel scent to be too strong... it's just a perfect scent for the season. There's also bergamot oil in the ingredients, and I just love that smell for this time of the year! I'd definitely pick up another one of these. I've broken it up twice already, and I can probably get another 3 baths out of it. Look at how bubbly a little piece is! 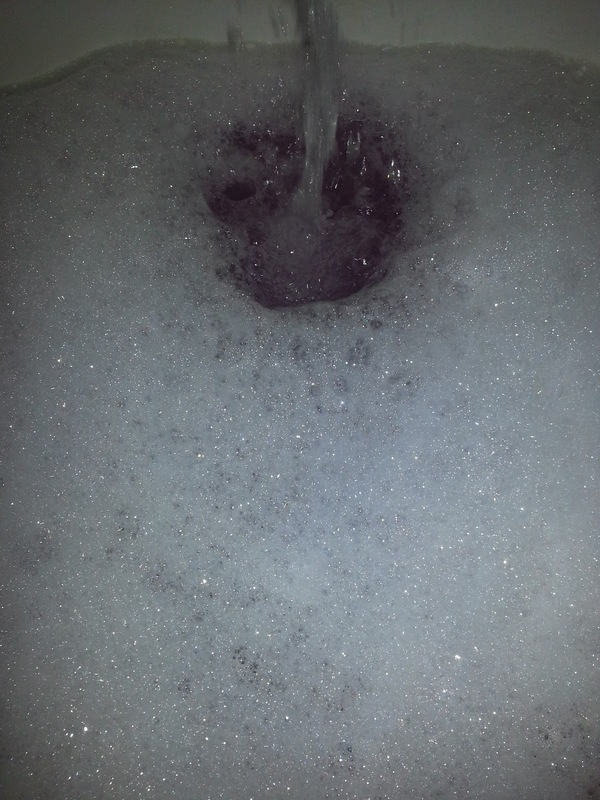 AND since I used a smaller amount, it didn't stain my bath tub like Santa did. Yay in my book! 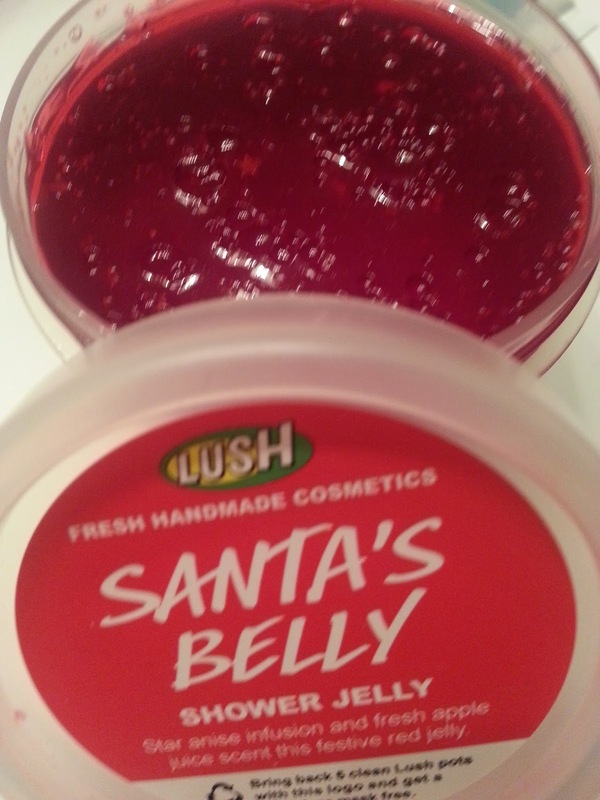 Santa's Belly - Shower Jelly - "This deep red jelly is full of Christmas magic. Star anise infusion, and fresh apple and grape juices are blended into the soft seaweed base to brighten and cleanse skin, and for their sweet, fruity scents. Biodegradable golden stars are sprinkled throughout for a dash of happiness. Keep the whole jar in the freezer, then bring it into a hot shower for a stimulating and refreshing apple-scented lather!" I've NEVER tried a shower jelly before. I kept seeing them on YouTube, and Instagram and I decided what the heck. It's seriously like jello! It's pretty cool. I wasn't sure how well it would work since I had never used one before. All you do is stick your hand in and break a little piece off. The first time I tried it, I used it in the bath and I wasn't very impressed. It didn't lather, and it kind of just got really slippery and kept falling out of my hands. The second time I used it, I smushed a piece into my loofah and it got REALLY lathered. It made my skin feel really soft, and smelled great. It smells more of apples to me than anything else. However, I don't think I would repurchase a shower jelly.. I think I will stick more to the shower gels. "Sweeter than dipping into the cookie jar, this luxurious bomb is sure to warm you up cold, frosty evenings. Spicy clove bud oil stimulates the senses while soy milk powder and organic shea butter create creamy, comforting waters. Luxuriate in comforting toffee soaks with clouds of gold and a touch of luster." This one isn't pictured in my photo because I got this one before this haul. I had seen some great reviews on it and wanted to give it a try. It's fairly large and quite heavy feeling. It's got that vanilla toffee scent, but it wasn't overly sweet. I didn't find that it lasted long either. I threw this into the bath as a whole and was quite surprised at what I found! It was kind of green-ish and very yellow when it fizzed. Except that's not the surprising part... this is! 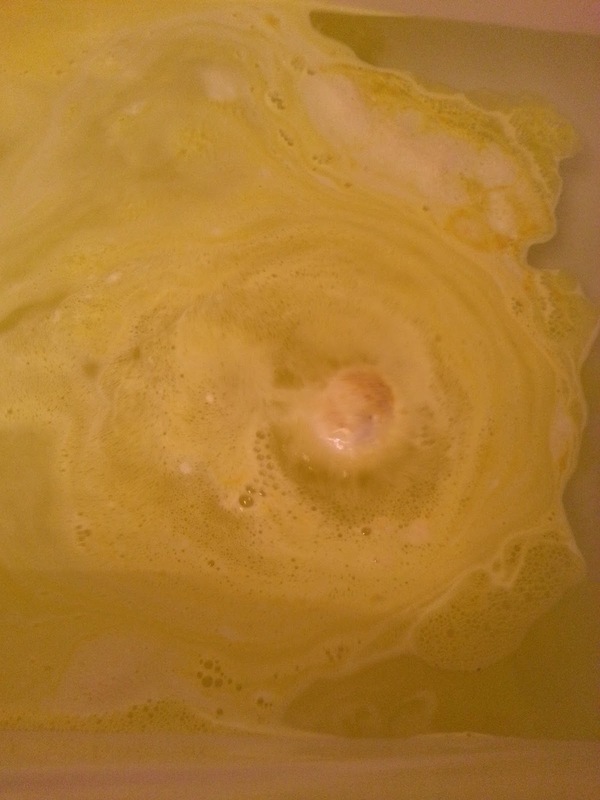 Once it has fizzled away, you are left with a bath melt. I saw this online but had never used one before so I thought it was pretty cool. 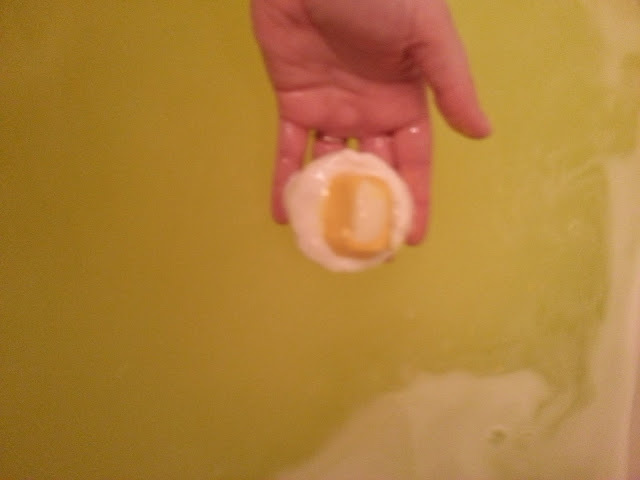 The bath bomb, and the bath melt were both VERY moisturizing. So it's perfect for the winter and dry skin. The only downside I would say about Yog Nog is that it left an oily yellow ring around my bathtub which was kind of difficult to wash away. It's not fun to have to pull out cleaning products to scrub the tub after relaxing, you know? 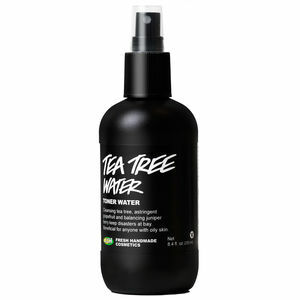 Tea Tree Water (toner water)- I mainly purchased this to help out with some break outs that I had been experiencing. My cheeks had been breaking out and even after washing pillowcases, washing my face more frequently, less use of face wipes... it wasn't clearing up. It seemed like I'd get a break out, and then it would start to go away, and I'd get another. I haven't had a break out on my cheek in a few weeks, so I thought I would incorporate the Tea Tree Water to keep the breakouts away even more. I use this after I have washed my face, and I don't spray this all over my face because I have dry skin, so I spritz some onto a cotton pad, and wipe it on my face where I generally get breakouts, and on my nose/t-zone just because I can tend to get a little oily there. Then I spray Eau Roma water all over. I got this in the smaller sized bottle because I figured I wanted to give it a try before committing to a full size bottle. 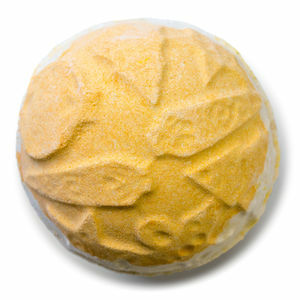 Cinders - Bath Bomb - now, I haven't tried this bath bomb yet. But the description (and the price.. let's be honest! 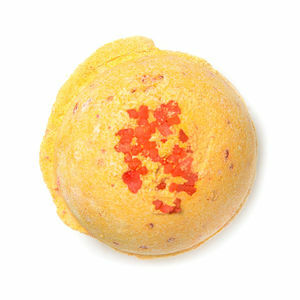 $4.95 is one of the lower prices for bath bombs) pulled me in. Here is what Lush has to say! "Heat up your holidays with this sweet and spicy bomb inspired by fireside gatherings with family and friends. We combine crackling vegan popping candy with stimulating cinnamon leaf oil to recreate the warmth of the hearth. With a bath so inviting, you can skip the open fire and curl up with this fizzer instead." 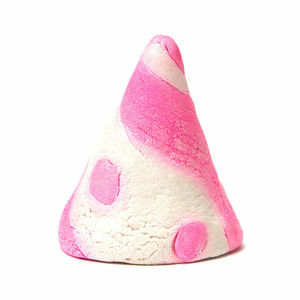 I love cinnamon scents, and I thought crackling popping candy inside would be interesting! I will do a quick review of this whenever I get the chance to use it! "Fair trade vanilla grows in view of the Rwenzori Mountains of the Moon in Western Uganda before being packed into this lustrous pink bubbler. Crumble it up under running water and sink deep into the glistening ridges of sweetly scented bubbles and comforting creamy candy scent. It's a sweet treat you won't soon forget." I will probably break this one up as well when I use it, so expect a review once I get the chance to try it! I've really grown to love Lush. I can't believe it has taken me such a long time to even try it! I will definitely keep purchasing their products, I find them to be affordable (well most of it!) and everything I have tried has been great.